"Architecture as a Political Instrument"
As the opening event of the conference, this tour provides an in-situ experience of Guimarães' history, culture, and architecture (EAUM), opened in 2004 and designed by the architects Fernando Távora and José Bernardo Távora, we will walk through Guimarães' historic center, a World Heritage site with its enclave of exceptionally well-preserved urban structure and medieval monuments. Then, wandering from the Castle hill through the narrow streets and main squares of the city center, we will arrive to the Largo do Toural and Alameda São Dâmaso, located outside the medieval city walls. The tour will then take us to the Couros area, old industrial neighborhood related to the tanning industry, that goes back to the Middle Ages. 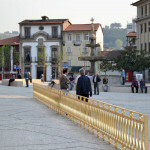 The visit to Braga will focus on three extraordinary architectural works: Braga's football stadium (2003) by Eduardo Souto de Moura architect (Pritzker Prize 2011); The Tree of Life Chapel (2010) at the Conciliar Seminary; and the Cheia de Graça Chapel (2016) in the Imaculada Chapel by Cerejeira Fontes architects. The aim of this visit is to present a unique experience of the Portuguese contemporaneous architecture with three examples that appeal to different scales and problematics of site-specific interventions.